Shopping for Christmas presents can be time consuming and stressful if you have a big family like mine. The stores are usually bustling and you’ve got to think carefully about each gift for each relative. Don’t get me wrong, I love the atmosphere of Christmas shopping, going out for a coffee, looking at the lights, and soaking all the festive cheer up. When it comes to actually buying all my gifts for my friends and family I do prefer to do most of it online. For a start, online is simply where the best deals can be found. You have a selection of products at your fingertips which can be shipped quickly and there’s no need to wait in irritatingly long lines. You don’t have to haul all those presents around a mall all day either, they are delivered and sometimes wrapped for you right to your door. Saving time, being efficient, and less fighting the general public for you in the process. For those of you wanting to avoid the crowds and get more options, hitting the net rather than the high street just makes sense! 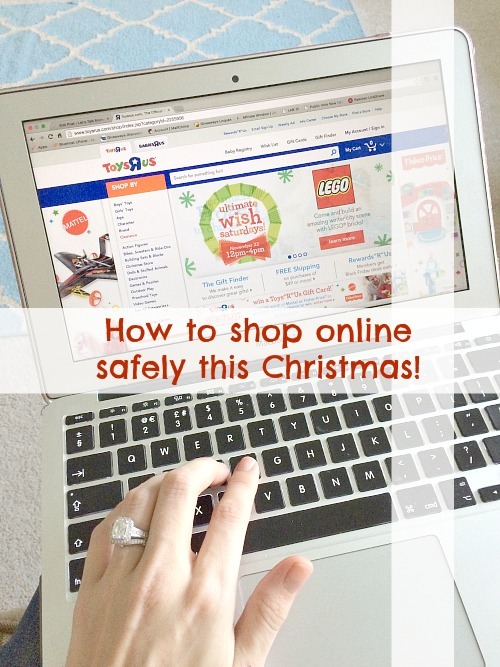 However, you do need to have some caution when shopping online. Not to scare you but not all sites are what they seem and there are things to think about before entering your details. We all might want to be merry and white at Christmas but there are people out there waiting to take advantage during the busy online shopping season. Under no circumstances should you enter your credit card details into a website that does not have SSL encryption. The easy way to tell if this security is in place is by looking at the URL when you go to the payment screen. It should now say https:// at the beginning and have a green padlock next to the address bar. If a website asks for information that is irrelevant to the transaction you are trying to complete, you need to be wary. Retail sites will likely ask for your email address as well as postal address, but they should never ask for details such as your mother’s maiden name or your date of birth. If they do, log off and look for an alternative site. You can get some fantastic deals online, but if something is really cheap then there must be a reason. In some cases it can be that the goods are counterfeit, with some not meeting the required safety standards. There’s also the coupon offers that claim you can get a discounted or even free product by entering your personal details. These are often shared on social media by unsuspecting people, but some of them are nothing more than phishing scams that will use your information for crimes such as identity theft and credit card cloning. In addition to the above, scammers often use incentives in order to install malicious items onto your computer. Some sites, for example, will automatically download malware to the terminal that accessed their site; without a good security system this can put your information and files at risk or even ruin the functionality of the system. A good antivirus software package works to identify these risks immediately and eliminate them. Please take care to be aware of the things above, I just had my identity stolen and bank card details used from shopping online. It is now fine and secure but it was a big hassle and makes me feel so vulnerable now when I want to purchase something online. Whilst it won’t keep me from shopping the net it has made me more aware of the dangers out there if I am not careful. Keeping these small things in mind will ensure your Christmas shopping is easy and stress free this year – and all done whilst having a cup of tea in the comfort of your own home! Do you like Christmas shopping online? Do you prefer to Christmas shop early throughout the year or last minute? Or are you the brave souls that dive in the crowds last minute to get it all done in one go? Would love to know, comment below. * this is a sponsored post but opinions are my own. I did all of my shopping online this year…last year and the year before I braved Black Friday, and there is no way I will do that again lol! The deals are just not worth my sanity!!! I find the peace of mind is a good trade for the lack of Black Friday savings 🙂 ! Exactly. I buy most things online and maybe venture out a few times just for the atmosphere minus the children of course. It’s too crazy! People actually get scary! Love black friday though.